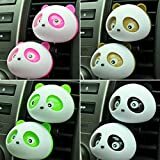 2 pcs Panda Air Freshener. Note: this color is random sending, not accept specified color, if you do not accept please not bid, thanks for your understanding! Please Note: this color is random sending, not accept specified color, if you do not accept please not bid, thanks for your understanding! Sustainable flaver can be 90 days. Casing Material: Plastic. Mickey mouse Air Freshener gives a attractive decoration for your Car. And it is very easy to use. It will improve your life and makes your life full of relaxation atmosphere. And also a great gift choice for yourself or friends.